Guardian of Gotham releases on November 22. 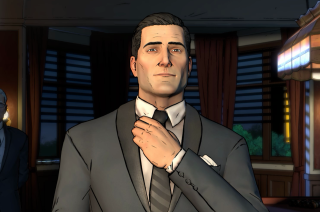 Telltale's Batman—that's the cel-shaded, choicey one, propped up by an engine well past its use-by date—is getting a fourth episode soon, and by "soon" I mean November 22. That's a Tuesday of course, in fact it's Tuesday next week, and it looks like the story is hotting up in Episode 4. Guardian of Gotham features The Joker, Harvey Dent/Two-Face, your man Penguin, and some intriguing bits set in Arkham Asylum. James Davenport wasn't overly enamored with the first episode, but maybe the series has picked up since then.